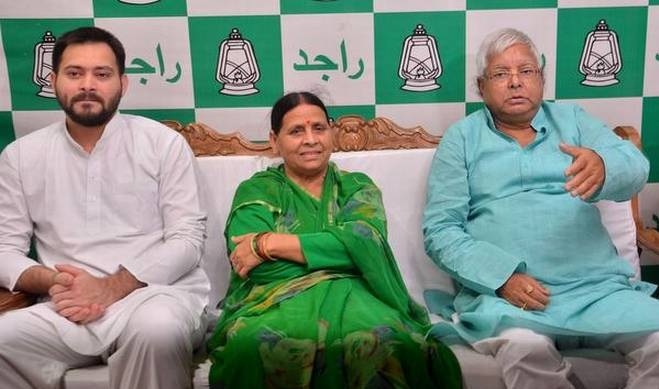 The CBI has filed a charge sheet against two companies and 12 people, including former railway minister Lalu Prasad, his wife Rabri Devi and son Tejashwi Yadav, for alleged irregularities in granting an operational contract of two IRCTC hotels to a private firm. The charge sheet was filed in a special CBI court in New Delhi. The CBI had registered a case in July last year and carried out searches at 12 locations in Patna, Ranchi, Bhubaneswar and Gurugram in connection with the case. The charges in the case include criminal conspiracy (120-B), cheating (420) under IPC and corruption, the CBI had said. The charge sheet said that between 2004 and 2014, a conspiracy was hatched in pursuance of which BNR hotels of Indian Railways, located at Puri and Ranchi, were first transferred to the IRCTC and later for its operations, maintenance and upkeep, it was given on lease to a private firm Sujata Hotel Private Limited based in Patna. It alleged that the tender process was rigged and manipulated and the conditions were tweaked to help the private party (Sujata Hotels). It is alleged that Vinay Kochhar on February 25, 2005 sold commercial property in the form of three acres of land in Patna through 10 sale deeds for Rs 1.47 crore to Delight marketing in which Sarla Gupta was a director as a front benami holder on behalf of Lalu Prasad. Subsequently between the period 2010 to 2014, this land was further transferred, the CBI alleged. In 2001, a decision was taken to handover management of catering services of Indian Railways, including of its hotels, to IRCTC. Two such hotels namely BNR Hotels in Ranchi and Puri were also identified and an MoU was signed between the Railways and IRCTC on March 19, 2004. Lalu Yadav, the then railway minister, allegedly entered into criminal conspiracy with owners of Sujata hotels, Sarla Gupta, wife of his close associate Prem Chand Gupta, an RJD MP in Rajya Sabha, and IRCTC officials for "undue pecuniary advantage to himself and others", the CBI FIR had alleged. The CBI has alleged that Lalu Prasad, as Railway Minister, was aware about the whole process and was keeping a track of the tender proceedings. It surfaced that while over 15 bid documents were received for both the hotels, IRCTC has no records of bidders other than Sujata Hotels. It is also alleged that with an intention to render undue pecuniary gains to Sujata Hotels, bid of another hotel was deliberately and unreasonably given low marks under technical evaluation. After the tender was awarded to Sujata Hotels, the ownership of Delight marketing also changed hands from Sarla Gupta to Rabri Devi and Tejaswi Yadav between 2010 and 2014. By this time Lalu Prasad had demitted the office of Railway Minister.